We arrived at a gloriously sunny Holiday World roughly thirty minutes after opening, and immediately began a practical investigation into the condition of the three wood coasters, Raven, Legend, and Voyage. All were running beautifully, a testament to how good the maintenance crews are at this park. One of the two major additions for this year is to be brand new Timberliner trains on Voyage, but due to teething problems with the design they are not ready to carry passengers yet. We spotted some personnel from The Gravity Group removing seats from a train, indicating that there's still some work to do. Unfortunately, two of the three original trains were sold onto another park late last year, leaving a major conundrum; how to optimise throughput on a lengthy and popular coaster with only one available train. Rather than operate their star attraction at reduced capacity, Holiday World staff modified one of the trains from the Raven to support the increased banking required for use on the Voyage, thus keeping queues to a minimum. I'll leave it to the reader to speculate on just how many other parks would be prepared to invest so much time and effort on a temporary fix. The other new ride this year is Wildebeest, the world's longest water coaster. 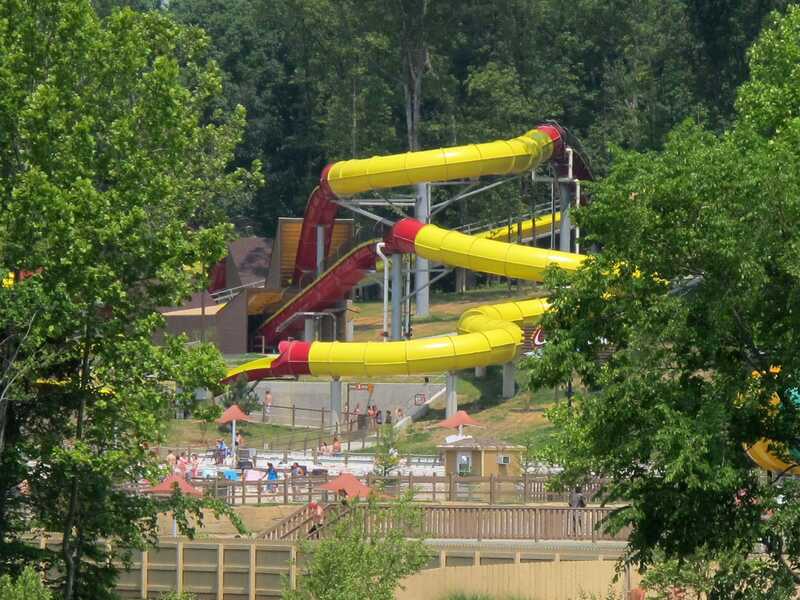 The ride is fundamentally a water slide with rafts, albeit one with fast moving upward sections powered by linear induction motors. I'd never ridden anything quite like this before, and I've got to say that it was a huge amount of fun, even with a metric ton of oversized American female sitting on my foot! Holiday World is onto a winner with this ride; I'm sure it won't be long before versions start cropping up in other parks. New since my last visit was Pilgrim's Plunge, a huge giant splash ride with a rather crazy looking vertical lift hill. Personally I'm not a particular fan of getting completely soaked, despite the summer temperatures over here. Recognising that some people feel this way Holiday World has built a special pathway to this ride from within their water park, allowing it to be enjoyed by those wearing swimwear. I'm glad I chose that option, as a large wave broke over the side of the boat, totally saturating me! The last new-to-me attraction I tried was Bakuli, a ProSlide Bowl Slide. This was a new genre for me, and it was certainly fun though not something I'd be prepared to wait more than a few minutes for. Having said that, the other three people in my raft seemed rather more enthusiastic, running from the exit right back into the queue.